I covered aspects of this review in my post on Stage 5, when pushing last weekend to finish Assignment 2 before the end of April. I now feel a bit more is needed to support the work I’m sending in for tutor review. It leads to repetition in blogging, but more clarity in Assignment presentation. Selection and interpretation of design material: I was able to select a range of design material from sketchbooks and earlier assignment work. Different elements were developed as stencils, stamps, resists and also in a more spontaneous way with the perspex printing plates. The most successful was the black/orange ink scribble, which combined with the technique I chose to give a lot of room for energy and spontaneity while doing the actual printing. The colours used were also well suited to graphic 2D printing. The tutankhamen design led to some of the best and the weakest work. 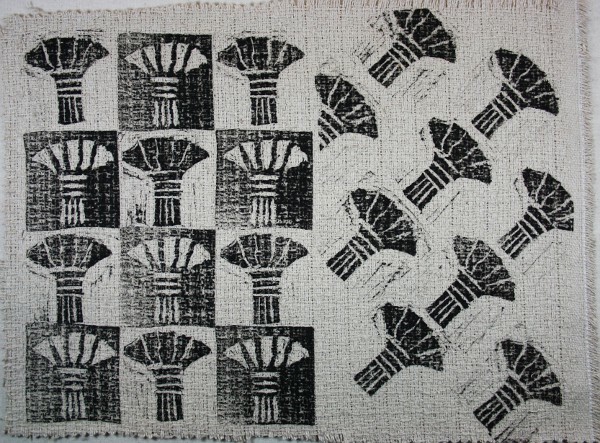 Interpreted as two stamps, positive and negative, it allowed development of some interesting designs. However I found my initial work reproducing the fully developed design so flat and boring that I didn’t continue. Possibly I’ve just overused that design, but also it would be more interesting with extra dimension – perhaps some stitching to develop the background, and the columns appliqued or padded. 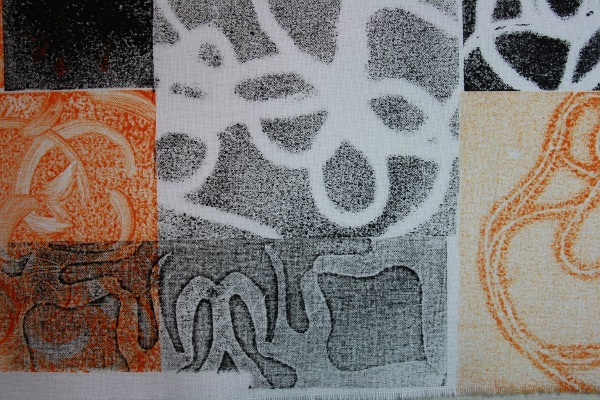 Fabric choice: I used a range of fabrics in my initial experiments – natural and man-made fibres, a range of textures. 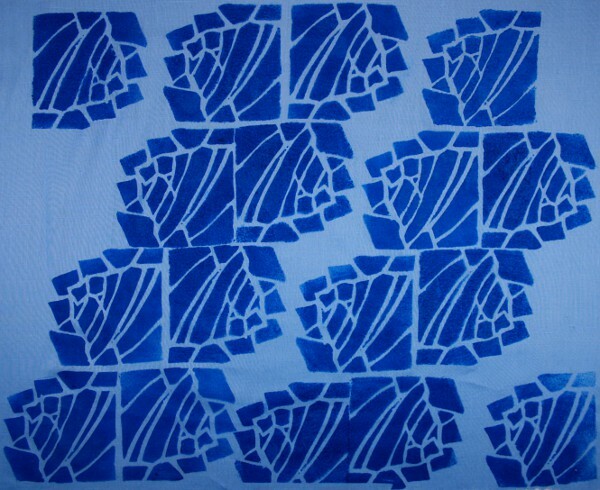 In later work I gravitated to cotton and silk, most often with smooth surfaces. Using dyes on silk allowed me to maintain the hand and sheen of the fabric. Touch is an important part of my response to cloth and when using the textile paints I preferred the samples which didn’t become too stiff. The more transparent fabrics have a lot of potential for overlaying, creating more complex imagery. This is definitely something I want to explore. Scale, spacing, contrast and harmony: In the initial set of fabric tests my focus was on the marks made using different application methods on different fibres and textures. In all the other sampling I was aware of positive and negative space forming as I worked. 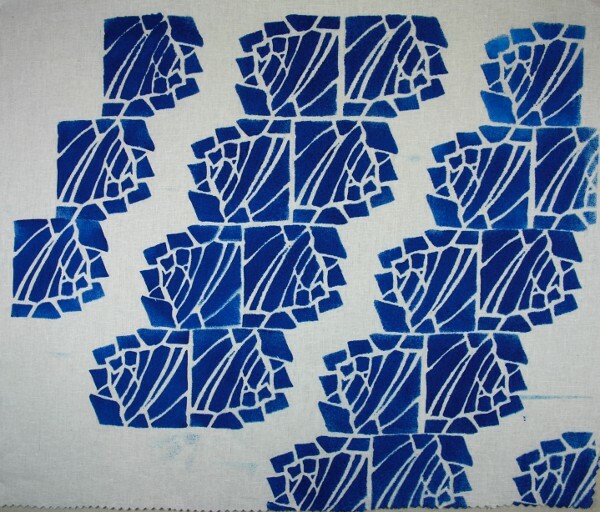 The shell stencil repeat wasn’t as successful in practice as in my earlier development work. I wanted a bold print, but the paint was rather thick and stiff. The spacing between rows of printing wasn’t right – I think slightly closer lines would have been more interesting. Also I would prefer either more randomness in placement or less. It just looks a little sloppy. The tutankhamen-based stamps were particularly successful – the effort of producing two matching stamps was worthwhile and gave a lot of opportunities in building up designs and in combining multiple colours. 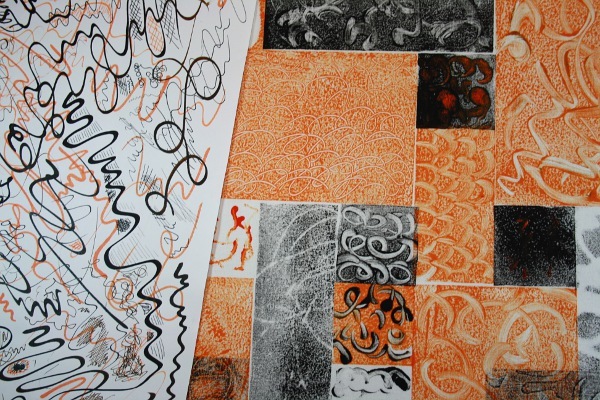 In the two larger samples – the scribble and the jug – I was able to get positive and negative motifs by using the ink remaining on the silk screen and print plates. This has additional benefits in providing different amounts of coverage and so intensity of colour. Success of larger sample: This is covered in detail in my post of 26 April. There are specific aspects I really like, but it doesn’t quite work as a finished piece. Other comments: I was fairly narrow in my printing and painting experimentation. My major focuses were different ways of applying fabric paints to mainly natural fibres, and attempts to use thickened lanaset dyes on silk, with a tiny amount of inktense pencils and fabric markers and crayons. I concentrated more on the range of marks and textures I could achieve. As with other parts of the course I was only able to scratch the surface and make a start. 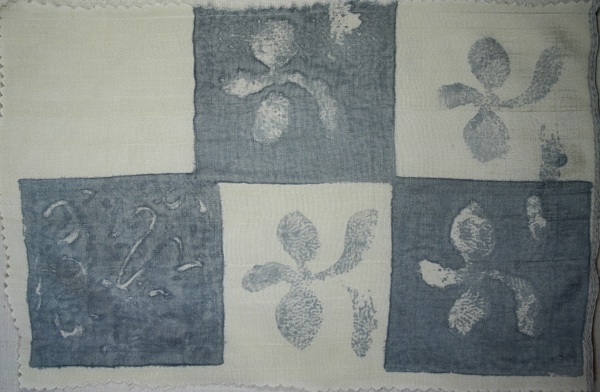 To an extent I was building on previous experience – in class situations I’ve used indigo, various dyes for cellulose fabrics (procion, drimarene K), dye discharge (that one at home too, using TUD), disperse dyes and bleach. I’m also enrolled in an ATASDA workshop using disperse dyes later in the year. More importantly I think, I feel confident about being able to extend my skills with other materials and techniques, using all the different sources of information available and my own experimentation. 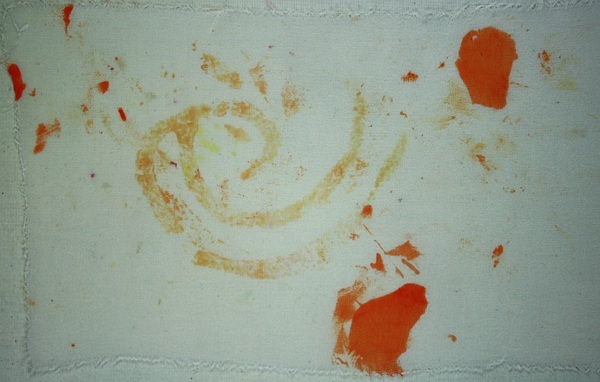 Rust dyeing in particular could fit with a theme of memory and aging. One major difficulty for me has been energy levels and the poor choices I make when tired. For example one day I didn’t feel up to original work and instead washed a bundle of samples. It was a bad choice not to sew over the edges of the more loosely woven fabrics but at least I thought briefly about it – unlike how unwise it was to wash black and white samples together. I was lucky that nothing ran badly, and some concentrated work with a clothes brush fixed the rest. Another day I’d just put my orange/black scribble fabric in a bowl of water when I realised I hadn’t ironed to fix the textile paint! Fortunately it had been pinned on a notice board for a few weeks and there was virtually no runoff. There were two highlights during the project for me. 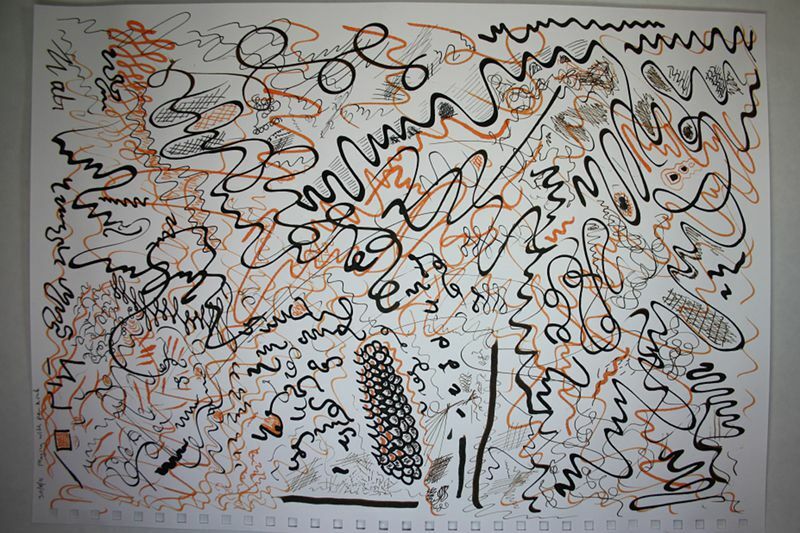 The first was the work with perspex plates on the orange/black scribble. The whole process from selection of design material, through figuring out techniques and materials, to actually producing the sample went really well, with a good balance of preparation and spontaneity. The second was resolving the problems I had with the thickened dye paste. I still haven’t been able to make good use of a gelatin plate, but I was able to adjust my methods to get effective results. 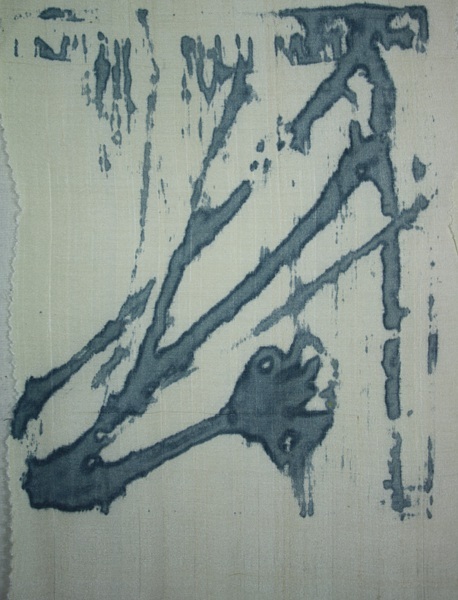 Lanaset dyes printed on silk (felting paj). 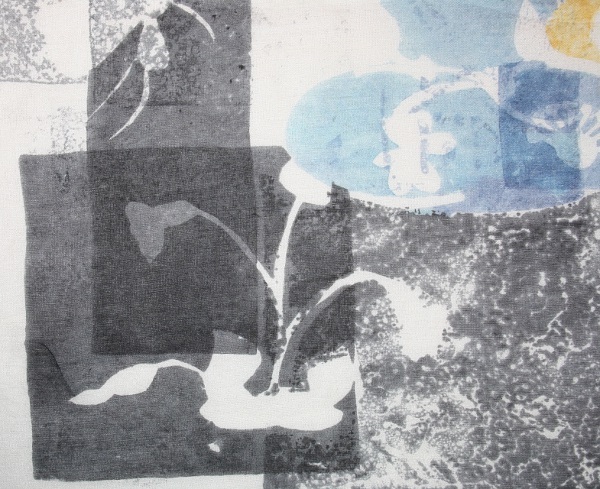 Printed area 44 cm wide x 52 cm high. 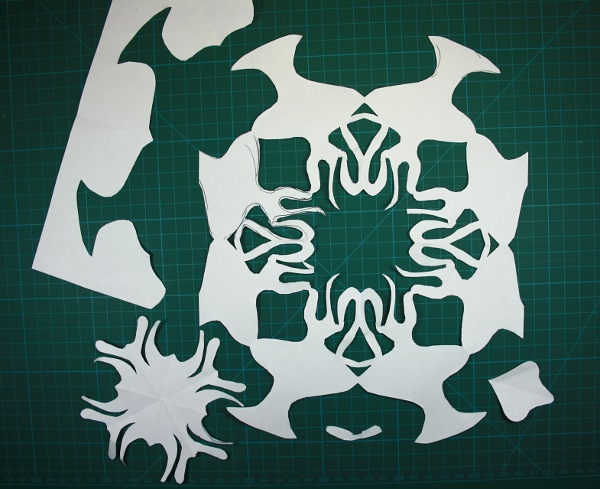 This final stage of the project asked for a larger sample, a repeating pattern and/or a “single unit” piece – a design complete in itself. I felt I’d done enough repeating work already, so just went for the contained design. The subject is a jug that’s been passed down through the family and I now have on permanent loan from mum. It’s appeared on this blog before – it was the subject of my very first OCA sketchbook page here, and blogged here. There was a quick profile sketch then a paper cutout in March, which was used as a stencil resist in the orange and black scribble printed fabric that I was very excited about here. Focused work on this iteration began on April 16, which I’m amazed to find is only 10 days ago – it feels I’ve been living with this much longer! A day by day, blow by blow description of the development process is in the sketchbook beginning here. Apart from the obvious of wanting to meet course requirements, I was interested in extending the work previously done. 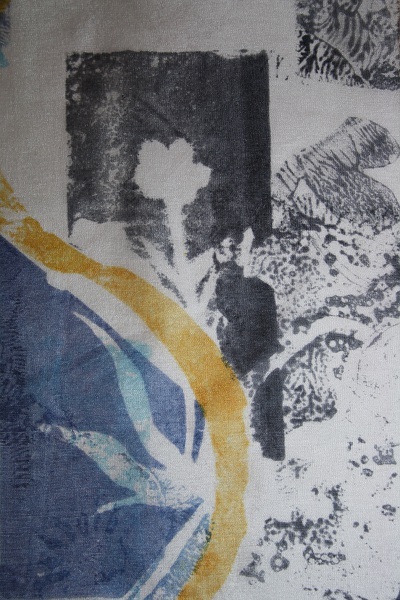 The printing on silk I’d done in Stage 3 led to some interesting overlapping images and had me thinking about the nature of memory and images from the past. The process had also highlighted some technical issues in terms of size of prints I could achieve. I felt the use of perspex plates seen in the scribble print could help with that. After a couple of quick sketches I settled into the practicalities – for example to keep on shape and the squares on a grid I would have my printing surface, then a full-scale printout of the vase silhouette complete with a printed 5cm grid, covered by clear plastic; then creating lots of paper resists and playing with placement. This blog post by fellow OCA student Lucie stopped me in my tracks. I’d forgotten the design process. I hadn’t explored options, I hadn’t focused in on interesting areas, I hadn’t tried different media. I’d had an idea and I’d set about making it happen. <– Note the full stop. Worse the idea was so literal – a jug plonked down in the centre of the image. 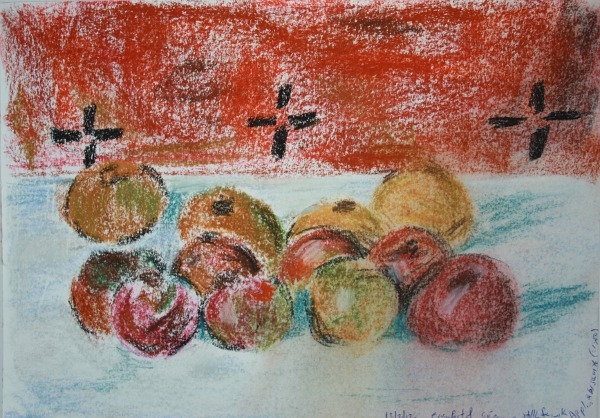 I tried a quick idea of some kind of still life (thinking about Cézanne this time, and a little sketch thing I did here) but my heart wasn’t in it. Apart from anything else I was curious – would the ideas I had so far work? After all the preparation and thinking, in the end it came together quickly. I had a printing session yesterday afternoon, then when I went to continue the work this morning I decided it was enough. None of the additional ideas I had would make it better – just different. Now having steamed and washed and ironed and pinned it up on a board and sat looking at it a while I can see heaps of flaws and problems and things to do better, some specific things I wish I hadn’t done – but overall I’m very pleased with it. Selection of design material: The designs I selected back here were shells, Tutankhamen inspired, ink scribble and bird. 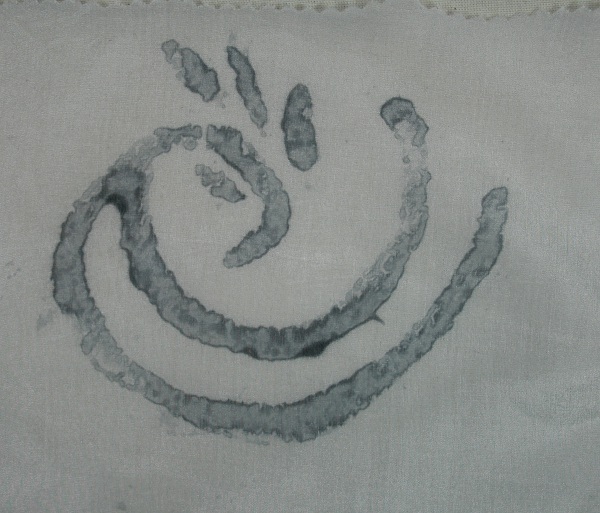 The ink scribble worked best – it had a strong graphical element which worked well with the stamping technique. I also enjoyed the liveliness and flexibility it offered. I did a lot of stencilling with the shell design. It was reasonably effective, but unsatisfying in that I didn’t develop it further in the process. That’s in part due to the nature of repeating patterns – design and plan up front, repeat as accurately as possible thereafter. My favourite tutankhamen design didn’t work out. 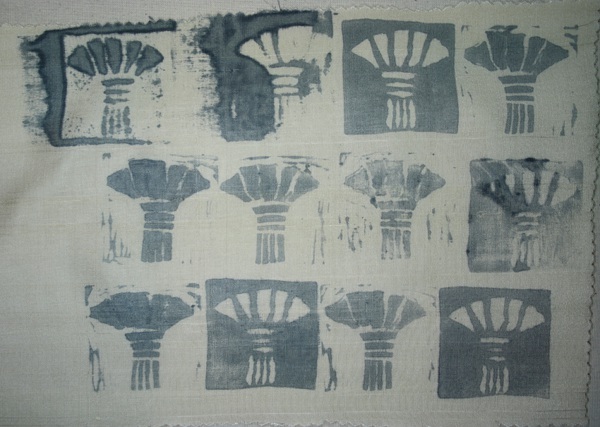 I didn’t like the dye-paste print on the silk that I had in mind, and more importantly I think I’ve used the design enough for a while at least. 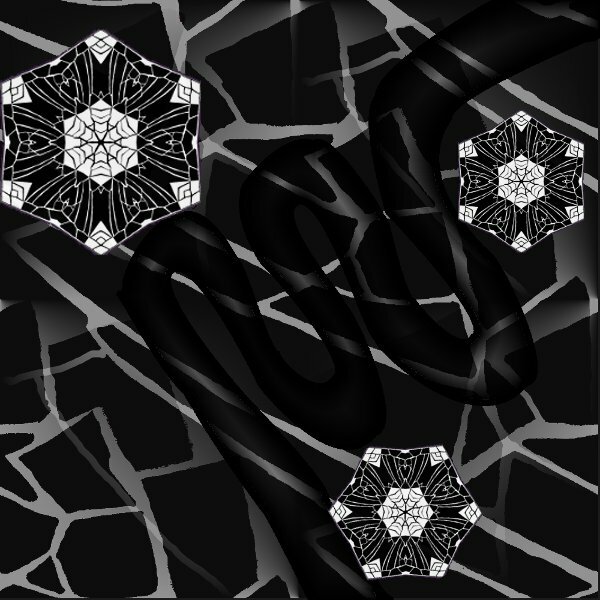 On the other had I was able to use elements from it as stamp motifs and they worked nicely (they were the basis of the overlapping example shown above). Although not on the list the jug has appeared repeatedly in my work to date. My use of it also built on the scribble technique and the layering achieved with the tutankhamen column motif. Overlapping and fractured images fit with my ideas about ageing and memory – topics that I’m considering exploring as a theme later in the course. The jug is part of family history, family memory, and it has a range of seemingly unrelated motifs jumbled around on it. I think this works well with the techniques used. Fabrics chosen: I tend towards natural fibres and in particular I love silk in all its guises. It’s partly the simple “natural = good” message, although I don’t hold to that in dyeing. Silk is special. It dyes easily, takes colour well, generally feels good whether satin smooth or raw and slubby or crisp in organza. It seems to generate or amplify light. For the final stage I chose a very light felting paj. It gave the most interesting patterning in my sampling and has a beautiful gleam. I have vague notions of using some of the ideas in nuno felting in the future. Finally, it’s light and postage limitations are always a consideration for the course. I did consider some heavier silks, but the habutai just looked a bit bland and I thought a textured silk wouldn’t work well as an interpretation of a glazed ceramic. Scale, spacing, contrast and harmony: The scales of the marks and shapes work well in the piece. 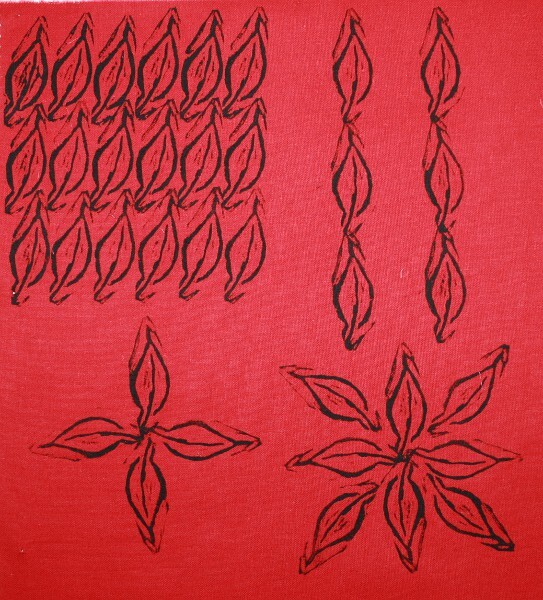 The individual motifs vary in size providing variety and additional interest. The fabric itself is well suited to the project, as discussed above, but in this form is not really practical. It is too lightweight for durability in most applications. 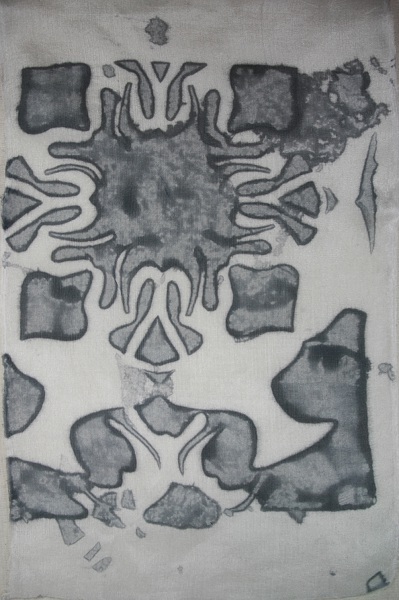 If used in felting I would expect loss and distortion of the image – which of course has its own potential. When I decided the piece was finished I thought there was a good balance of shapes across the design – not even, but balanced. Now I see it finished and pinned vertically some areas that I thought were restful and interesting white space don’t really work. In particular the space in the left background near the handle is too large and it would probably have been better to indicate the narrow area near the foot more clearly – or at least one side of it. 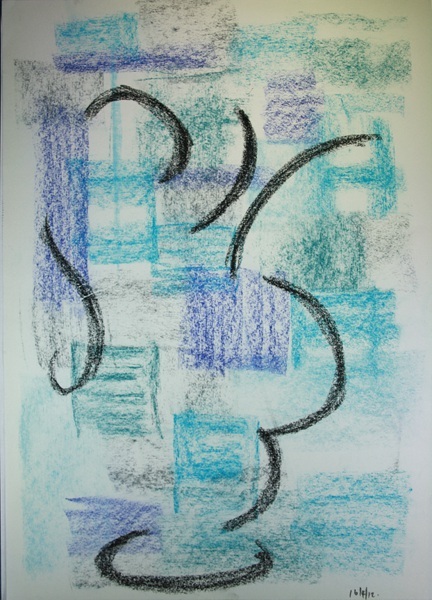 However I am very happy with the overlaying of images and colours, the positive and negative shapes formed and the complexity of image I achieved. 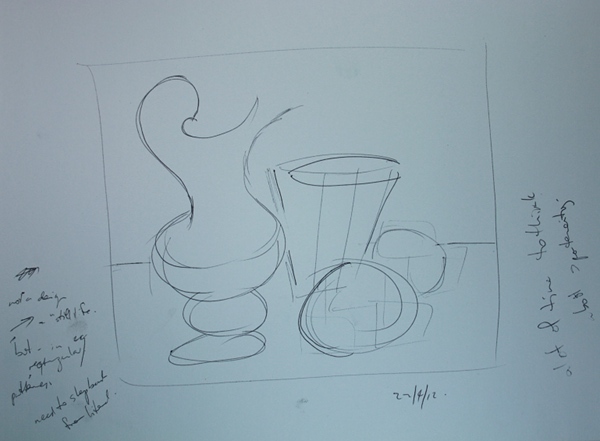 Soon after beginning work I changed my mind about how to handle the definition of the edge between jug and background. My original intention during planning was to use masks all around the edge, but I was concerned that this would make the overall shape too obvious and literal. I decided to cut off rectangles with a sharp angle when crossing the boundary, giving a kind of pixilated-on-large-scale edge, then define some areas with an added line. I thought this would make an interesting contrast of geometric and organic shapes. In practice I found the diagonal cuts jarring, and felt the complexity of the decoration would work better with a smooth, curving boundary. The early cuts are still there of course. I think it was a good choice to change. 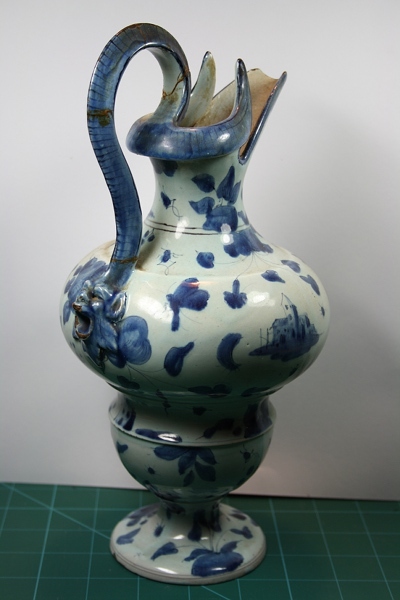 The top of the jug is also a problem area – the spout and horned detail are too dark and flat, the top curve of the handle too undefined. I particularly like the areas where the motifs cross the boundary of foreground and background (although the one on the right below has one of those annoying sharp diagonals). 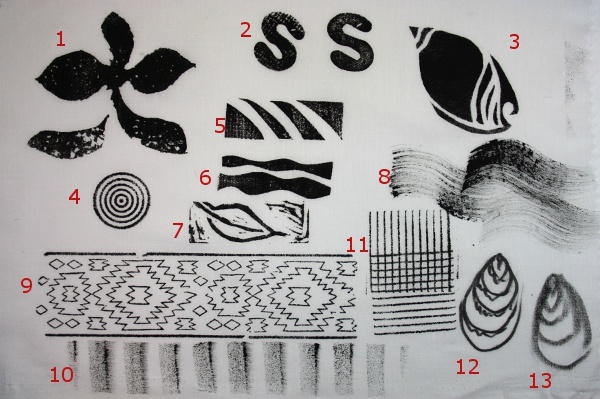 I prepared both positive and negative versions of stencils to get further variety in the image which generally works well, except for a clumsy repeat of white on black close to black on white of a small plant mid-right background. Also I intended a more gradual and general movement of value in the background from dark at the bottom to light at the top. Unfortunately I haven’t achieved that. Really the overall balance of value isn’t right. I like the range of colour used. Possibly it could be richer/deeper, but I didn’t want to risk losing the overlaying of shapes and imagery. Overall success of sample and design: All the above issues aside, I think there is both contrast and harmony in the piece, providing an interesting, varied and harmonious image. The layering and complexity of motifs works well, providing interest at a detail level. The treatment is very appropriate for the subject matter. The distance view is not quite so successful, with some distracting, clumsy areas. Also with so many rectangular elements I wanted to make the outside border of the image uneven, but I think the result goes too far. Near the bottom right in the background is a small stencilled jug shape. I thought it might make a good visual clue if the overall design turned out too messy. I’m probably too close to the image to judge, but I hope that the overall shape is apparent (effectively making the small shape unnecessary and a bit cheesy). The orange defining lines were a late addition to the design. 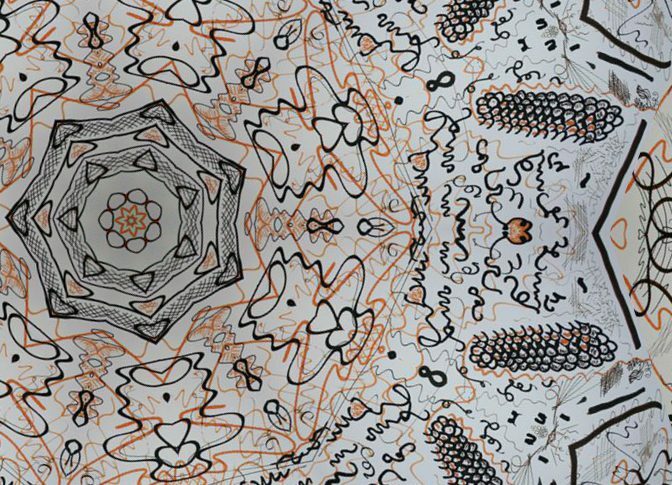 The original sketch used black lines and the idea of the complementary orange was always on the list of “maybe somewhere”. In the end I think the amount of orange used is about right, and the extra definition helps to clarify the shapes. Although there were some poor choices, I was pleased that I was well prepared but not over prepared – there was still some flexibility and spontaneity while actually doing the printing. I’ve read comments (and made them myself) in blogs and forums about various difficulties and disadvantages of being a distance student. On the other hand distance learning has the advantage that in the end you are responsible for everything. There are lots of resources available – course notes, tutor, the internet (especially blogs and youtube), books, friends, guilds … – but in the end you choose the specific task to meet the requirement, gather the equipment, find solutions to problems and get a result (even if the result is “I don’t like this” or “it didn’t work”). I love going to classes, but they’re often exhausting, you can easily miss a vital something that makes everything work and there could be specialised tools or materials that you’re unlikely to invest in at home. To get the best learning I need to come home and try the technique on my own, using resources and material available to me. With this piece I feel a real sense of personal ownership and confidence. I know how to do every step involved. Overall I’m very pleased with my result. To be honest, this Assignment has taken so long I would have said “good enough” to almost anything, even a disaster that I could learn from. As it is I like the result, I like seeing the progress shown in my work and the development of ideas and techniques, and I’m sure similar elements will appear in future work. * Laporte, S. (editor, 2011) Picasso: Masterpieces from the Musée National Picasso, Paris, Paris: Musée Picasso, Paris. ** Maloon, T. (editor. 2010) Paths to Abstraction 1867 – 1917, Sydney: Art Gallery of New South Wales. 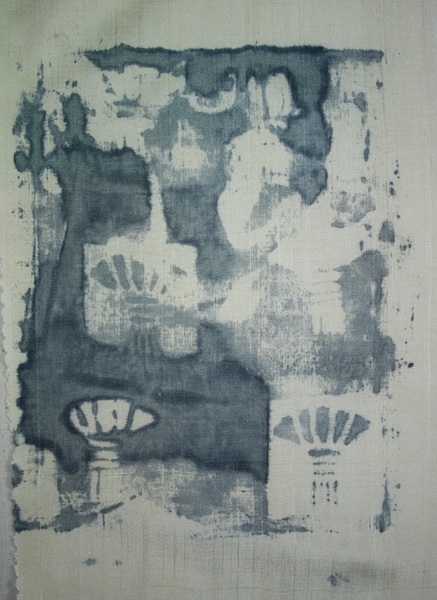 Printing and painting on fabric. I posted about my first group of work here. I was pretty happy with my results – some experimentation, some development of my chosen designs, lots of room for further work. The second round of work is here and I was super excited. I’d had an idea, worked towards it, and got results that exceeded my expectations with a strong development of the design and lots of future potential. 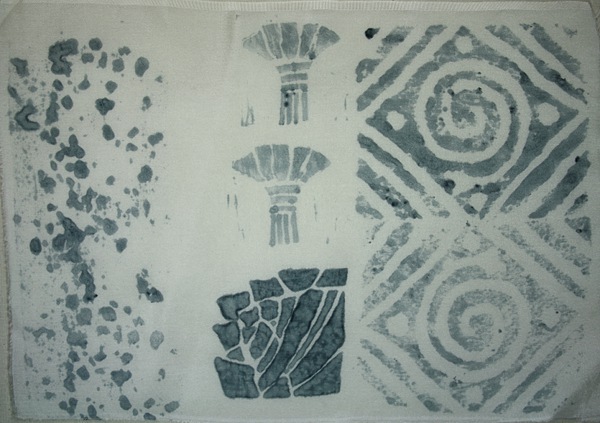 Most of the work to this stage used textile printing ink. 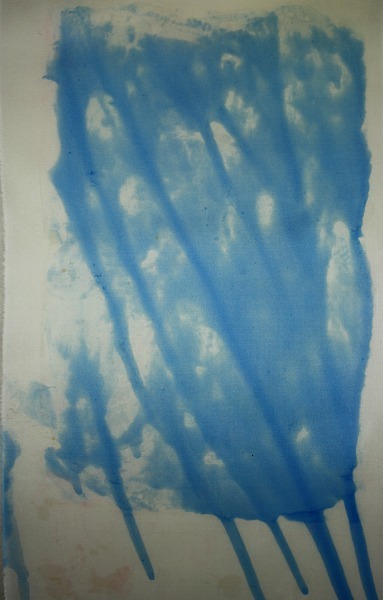 For my final experiment I wanted to use dyes on silk – using a fibre I love and trying to keep the hand and sheen. I’ve done some silk painting in the past, so was looking for something different. 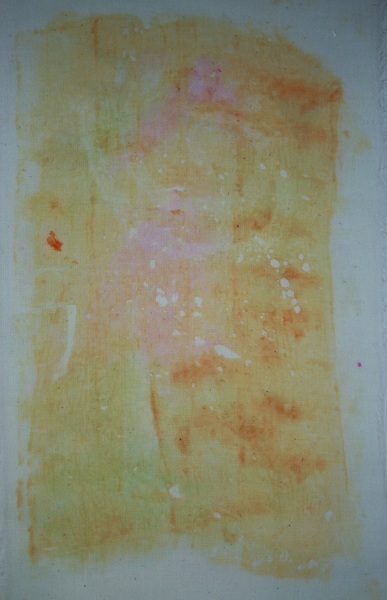 Some internet searching on monoprinting led me to Linda Germain’s blog printing without a press. She prints using gelatine – it’s definitely worth watching her video here to see the amazing results she gets. My plan was to make a gelatin plate. Instead of a commercial printing ink I would thicken some Lanaset dyes with DR33 (a modified guar gum I got a few weeks ago from Batik Oetoro). Lanaset dyes work at a pH of 4.5 – 5.0. I decided to soak the silk in an acidic solution, then dry and iron the pieces ready for printing, in the hope that steamed after printing and drying the conditions would be roughly the right pH. It all went horribly wrong. For some bizarre reason I decided to use a rusty old baking pan to hold the gelatin while it set in the fridge. I had trouble getting the set gelatine out of the the pan, so held it “briefly” in a larger pan of hot water to loosen it – which actually melted a large amount of it. To go with my lumpy, bumpy, sticky gelatin plate I made up some DR33. I’d found a variety of “recipes” on the internet and actually came up with something that looked roughly the consistency of the textile printing ink. Very roughly – the big problem being it was gloopy. It stuck to itself. If it deigned to attach to my foam paint roller, it attached in a big blob all in one spot. Somehow the roller couldn’t get any traction, so skidded over the gloop instead of spreading it nicely. I tried lots of ways to spread dye gloop onto melting gelatin gloop. 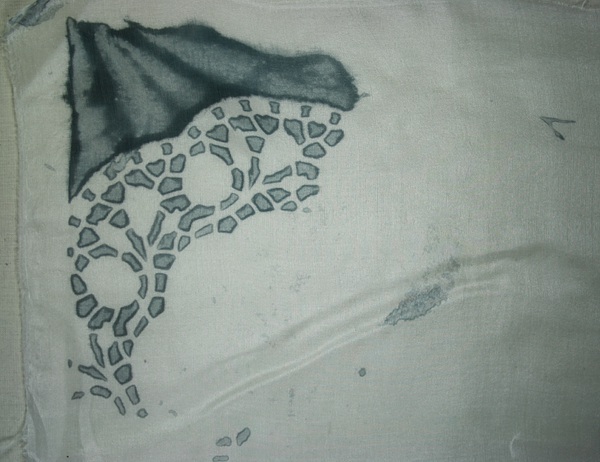 Occasionally something would end up on the fabric – blobs that ran down the fabric as it hung to dry. I attempted printing with my bird polystyrene stamp. It wouldn’t be accurate to call it a total failure, but only just. On the plus side, when dried and steamed the dye fixed and very little came out in the wash. Unfortunately some of the gloop also didn’t come out and the silk has completely lost its drape. With the wonders of hindsight, I’d set myself up for failure. Too many new techniques at once, too many approximations and make-dos on ingredients and equipment. This all happened almost three weekends ago. Mulling it over I decided the two main problems were: 1) experimenting with both the gelatin plate and the dye thickener at once; 2) the surface tension of the thickened dye was too great, so it clung to itself and wouldn’t spread out or stick to other things (like stamps) nicely. Last weekend I tried again, experimenting with adding albegal set and orvus paste to help with the surface tension problem. Albegal set is a surfactant used as an auxiliary with Lanaset dyes. Orvus is a detergent, sodium lauryl sulphate, that is good for washing silk. I learnt about both of these from Karren Brito’s book Shibori: Creating color & texture on silk (my go-to place on dyeing silk), but this use was definitely off script. I thought both had properties that could reduce the surface tension and help the paste to spread nicely. The learning curve continued – for instance adding a little albegal set can make the DR33 paste a bit thinner, adding rather more can turn the paste to liquid. Also take time about stirring the DR33 into a small volume of liquid and make a nice smooth paste. Trying to stir out lumps later is …(pause to find nice words)… unpleasant and time-consuming. Ultimately my printing paste was much better, but I still couldn’t get decent, even coverage on a stamp. I bought a small silkscreen and squeegee a month or two ago – still in the shop’s bag because I realised I was trying to do too many new things at once. Out that came, and I was able to squeeze the paste through with a paper doily underneath. It worked! 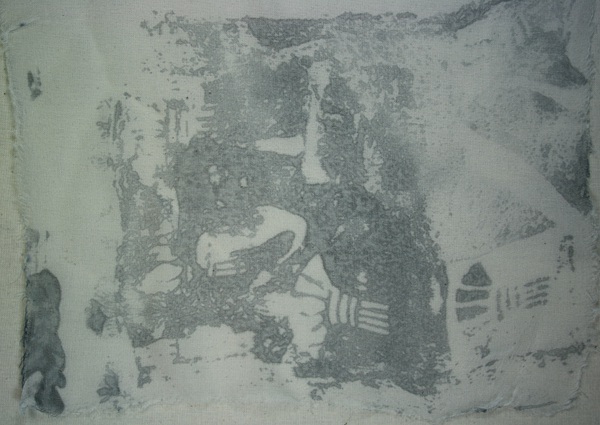 This was my absolute first-ever time screen printing and it got pretty messy – but I was getting imagery onto fabric. 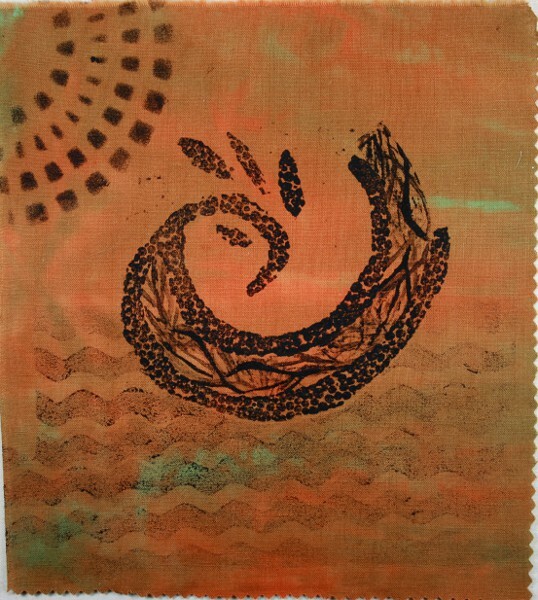 I tried the paper jug cutout (used in the orange/black squiggle), and after the print picked off the paper, put the screen on some more fabric and used a brayer to get off the remaining colour. Next was some grasses and (weed) flowers under the screen and got an image. 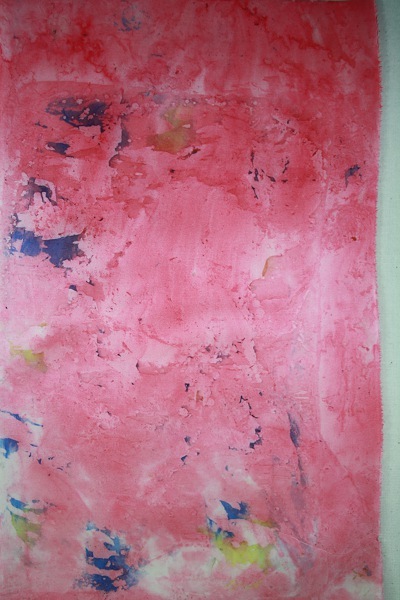 I used a brayer to get the remaining colour, but this time put an acetate sheet between it and the screen so I didn’t cause paint movement and smudging. This left some paste on the acetate, so I tried to print that off. At some stage I had the idea of screen printing onto stamps to get a spread of colour on them, so I was finally able to do some stamping too. There was a flurry of activity while I tried the two versions of the Tutankhamen stamps, getting images off the stamps and the screen. In the first photo below, top right are the original two stamps. Top left is the image taken from the paste remaining on the screen. That led me to create the bottom two rows of stamping, trying to apply the paste to the stamp through a different area of the screen each time. 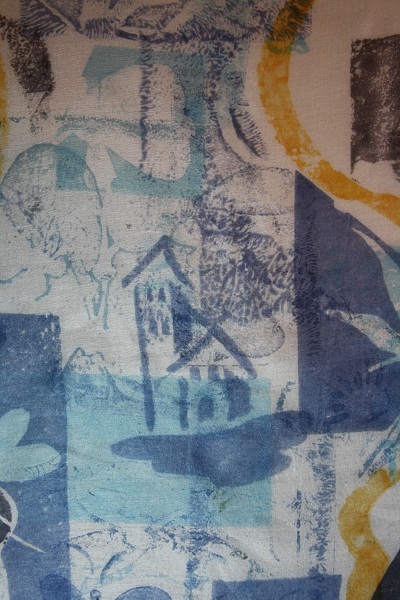 The second photo below is the print resulting from the screen – fabric on a printing pad of old newspaper, then the inky silkscreen, then a sheet of acetate, then roll a brayer over the acetate to get off as much colour as possible. 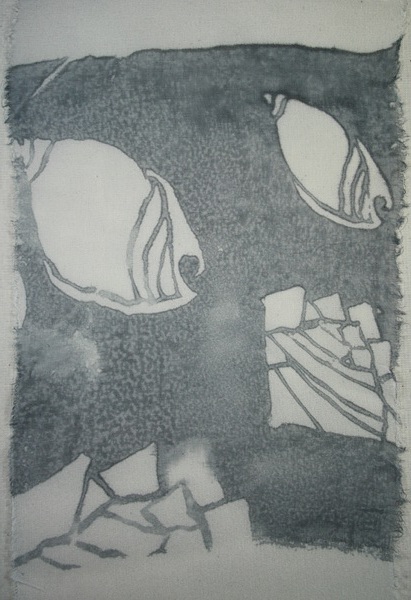 Some paste gets onto the acetate in the process, and the third photo below is the print from that. I also put a stencil under the screen, and did the same idea of a series to use up all the colour. 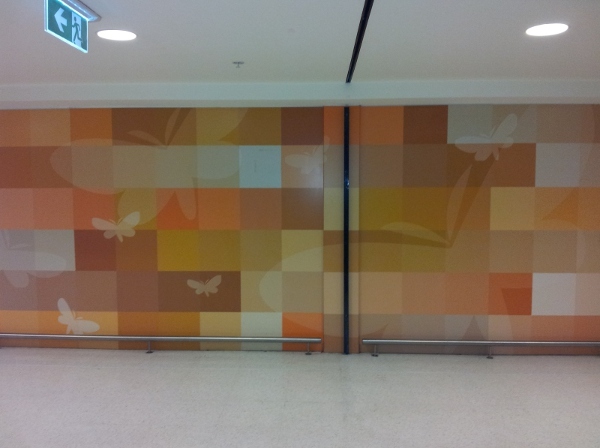 One thing that didn’t work so well was using the perspex squares. The idea was to get colour on them through the screen, then play around removing colour with a stamp and using both the stamp and the perspex to print. 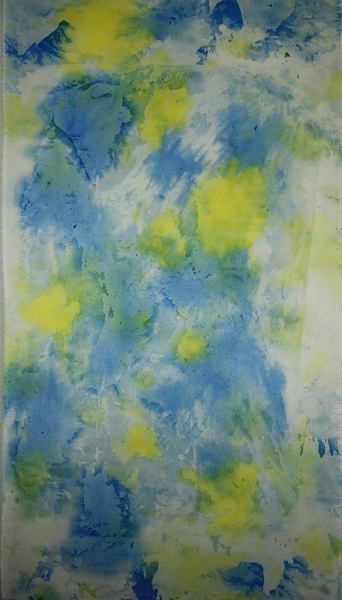 The paste went onto the perspex nicely, and dragging through the paint with a brush left an indistinct pattern, but it was very difficult to use a stamp – it kept sliding around on the pasted-up perspex, messing up the image, plus I wasn’t able to get enough colour onto the stamp. 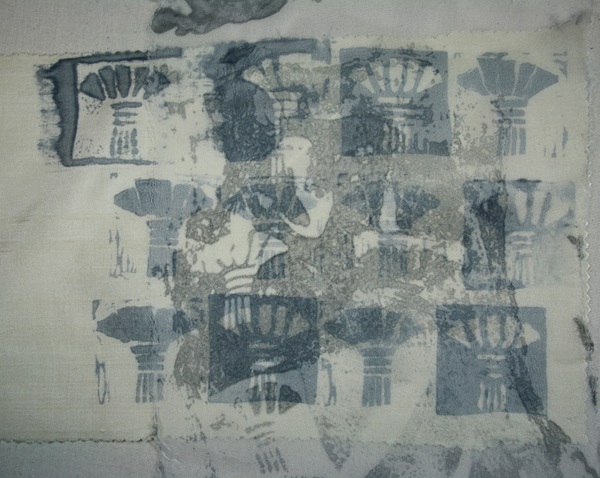 Another disappointment was screen printing onto the thick loose-woven raw silk, using a stencil developed earlier in the course from a Tutankhamen design. 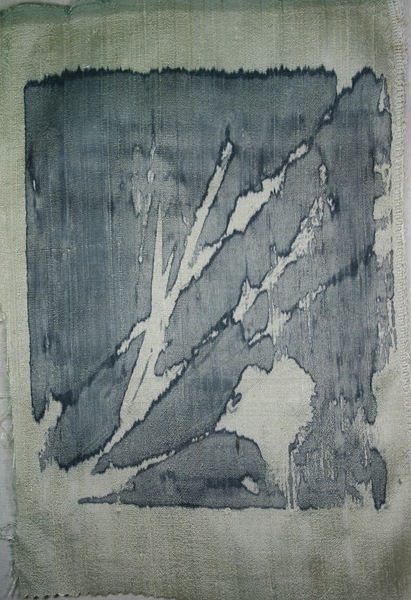 The result is just uninteresting, with no interesting variation in the colour and losing the character of the fabric. I was hoping this would be the basis of the larger work required in the final stage of the project, but it’s not exciting me. That was last Saturday and on Sunday I couldn’t wait (I usually leave a couple of days between each step when dyeing). I steamed the dried fabric, let it cool, washed it out in orvus paste and ironed it dry. There was virtually no run-off of colour. There is a slight stiffness in some of the thicker fabrics – a bit more patience in the washing could resolve that. The thinner fabrics have hand and sheen unchanged! 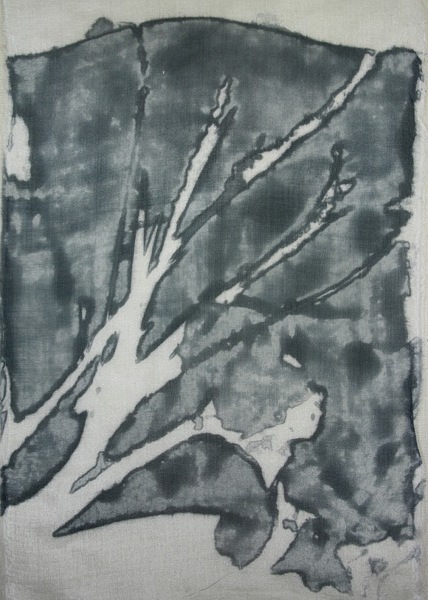 The colour is grey not black – I could use more dye next time, but in fact I find the variation in tone very attractive. With some finetuning I think there are possibilities for some very interesting, complex imagery with a nice mix of control vs serendipity. I’ve been thinking about themes of ageing and memory, and some of the partial, combined, changed, overlapping elements could work very well with that. In this final photo I’ve laid the last printoff of the tutankhamen stamp (on a light georgette) over the stamping on a Honan pongee tussah. I find the result complex and intriguing – definitely potential. I’ve decided to call this “enough” for this stage of the project. The last batch of work was more focused on getting a technique that worked than developing my chosen design ideas, which isn’t ideal. Even so, it’s time to move on to the final stage of the project (and assignment), which is a larger sample. 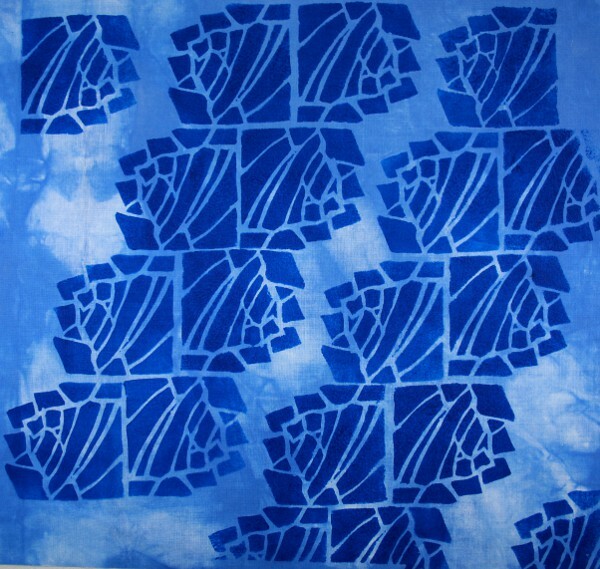 Brito, K. (2002) Shibori: creating color & texture on silk, New York: Watson-Guptil Publications. I wish I could bottle this feeling! Hopefully you know the one – when you have an idea that something could work, and there’s some organising needed and you have to wait a while and you think maybe this won’t work out and then you get the bits you need and you give it a go and things start looking interesting and you try a few more things and then you feel like running around the neighbourhood shouting “yes! it worked, and maybe I can try this and this and…” and you feel a bit silly for being so excited, but you are that excited. You don’t have to get as excited as I am. In fact it could be quite a letdown when you see what I’m excited about. I’m excited enough for all of us. On the left is my source sketch. 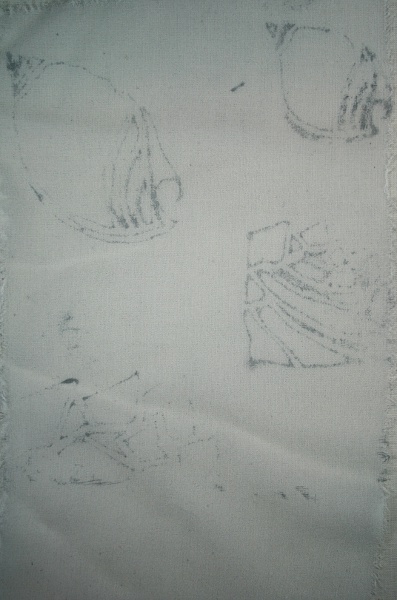 On the right is my stamped interpretation, on white cotton homespun. It really doesn’t. I’ll try explaining. Back here I chose an orange and black scribble as one of the potential design ideas for stage 5. Here in my sketchbook I jotted down some ideas for how I could interpret the source in a design. I needed some perspex squares and rectangles for the idea, so I found a local company who would cut all the small pieces of perspex I wanted. Today I collected the perspex. This is the full piece I printed this evening. It’s about 53 x 47 cm (say 21 x 18.5 inches). The smallest square is 5 cm (2 inches) each side. – work for balance with variety. Well, I haven’t done all of that. This first sample isn’t particularly balanced. After all, it’s the first experiment. But there are a heap of ideas and potential in there, and it really is a wonderful feeling when one idea leads to another and another and it seems endless doors are opening in front of you. I have a set of perspex squares and rectangles, 5 cm, 10 cm and 15 cm sides. 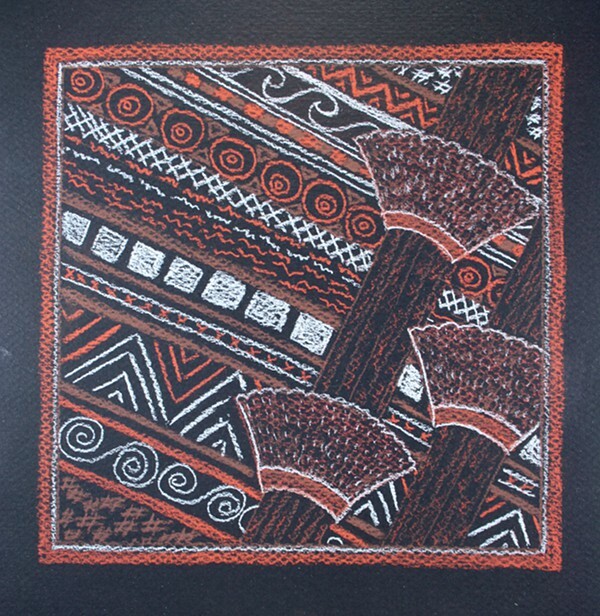 I rolled on textile paints – black and orange. I’m excited by the results, and that I can look at my sketchbook and look at all the steps and see how one thing led to another. And I look at what I’ve got, and it’s not everything I wanted, and I can see lots more possibilities to take the idea further. And while I’m certain the ideas aren’t original and that I’ve probably seen these things in the past and just don’t remember, it feels fresh and new and exciting (!) to me. And today is my birthday and I’ve had a glass or two (well, 3) of sparkling shiraz, and I think it’s pretty good to be 54 with family and friends who care and be able to get excited about some bits of perspex and paint and cotton. Not everything in my life is good, but an awful lot is, and I know I’m a very lucky woman. It’s funny what you don’t see – until I put these photos together I thought I had pretty much followed the plan (the black and white version created on the computer). I had a printout of it right beside me. Darn! The original is much more dynamic. While working I thought it was my sloppy positioning and some smears that made the difference. 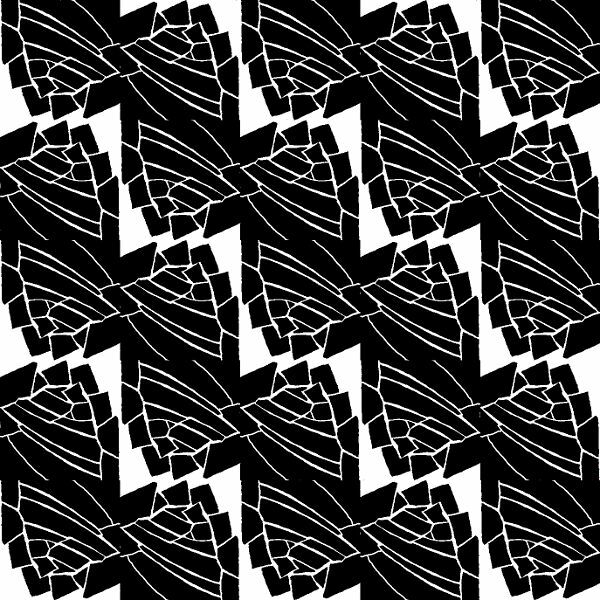 On the positive side, I think it shows that computer-based work is useful – I think it gave a good indication of how the pattern would work, apart from the execution mistakes. It’s also a reference for the effect of background fabric. I used a light to medium weight white stonewash linen, blue and yellow cotton voile, and a mid weight cotton that I hand-dyed a mottled blue some time ago and overall like the white linen best. Next up is some raw silk in a loose, uneven weave that I bought during the week. 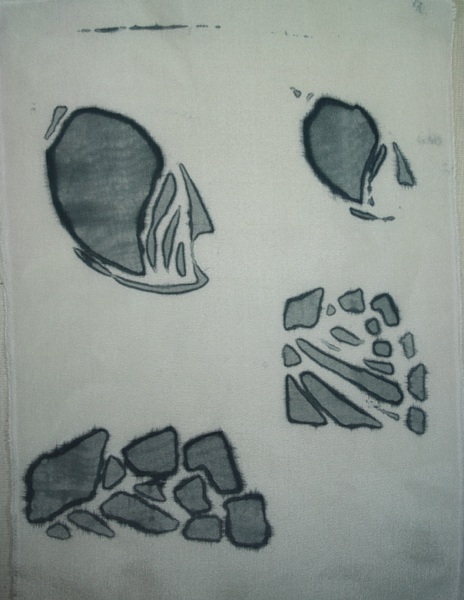 The stamps used were based on sketchbook work, culminating here. I used some ezy carve printing block I got from Lynne at Batik Oetoro – much easier to carve than the plastic erasers, and of course you can cut the size you need. Hopefully it’s obvious that the imagery is based on the Tutankhamen work I’ve been doing. So I don’t forget the method: I liked one side of a sketch variation and traced over it – first on one side of the tracing paper, then turned over to get a mirror image for the complete shape. I rubbed charcoal over the back, then put the paper on the ezy carve block and drew over the lines in biro to transfer the image. After cutting out the positive image I stamped it on another piece of ezy carve block and cut out just the stamped areas to create the matching negative image (not sure if an extra step would be needed for a non-symmetrical design). I particularly like the positive/negative counterchange area and I think the colours and texture of the base fabric work well. 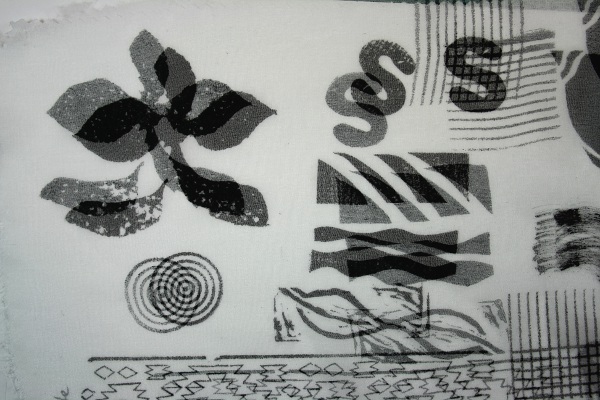 Next was trying to combine different types of stamping to form a single image. All of the stamps used have been seen before. The base fabric is a mottled orange/brown/green cotton homespun I dyed some-when. 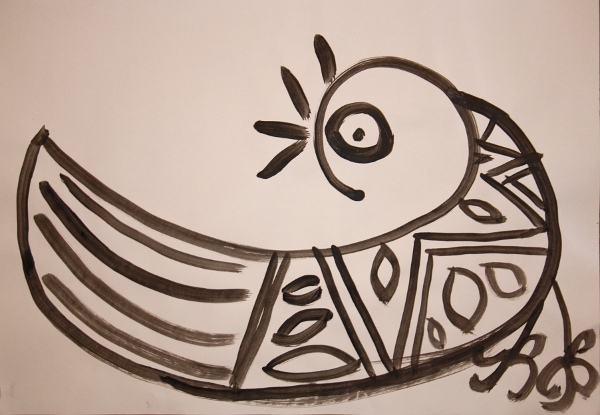 I rather like this, especially the “feathers” of the bird – actually overlaid impressions with different ink levels of the plastic eraser leaf stamp. 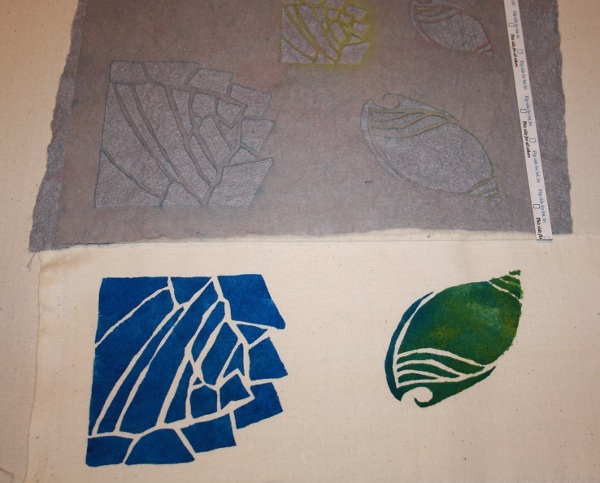 I continued with the leaf stamp, looking at ways it could be put into combinations to create overall patterns. I didn’t bother doing lots of repeats, but clearly the cross and star arrangements could be repeated, rotated, combined etc to form trellis and other arrangements. This is a medium weight red cotton. On the same red I tried combining the leaf and column stamps. It looks rather clumsy here, but this idea could work for the larger piece I’m thinking of for the next stage. I also tried different colour combinations for the positive/negative column stamps. All use black for the positive image. Top row has blue paint for the background. It looks very dark on the red fabric but has potential – especially with the flashes of red coming through. 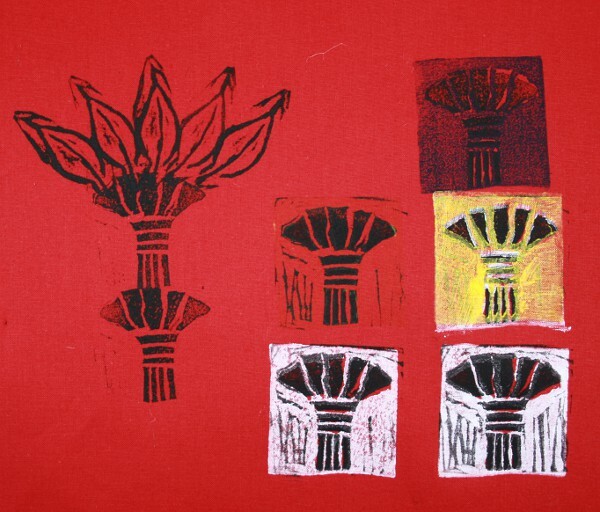 Middle row is yellow for the negative image – on the left direct on the red, on the right with white stamped on first. In some lights you can just see the yellow on the left, but only just. I need to practice with registration when over-printing for the idea on the right to be used. Plus using the black last instead of first would help. The bottom row has variations of amount of white used. 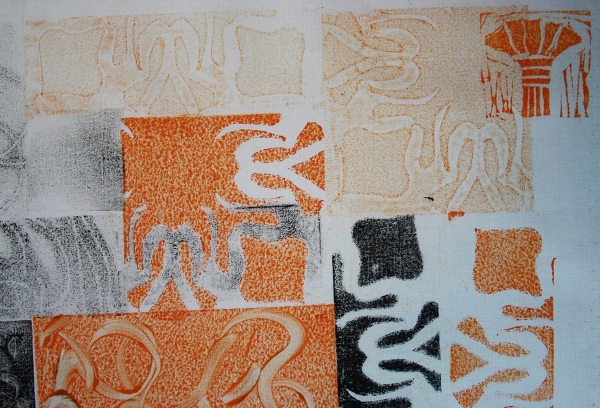 Wells, Kate (1997) Fabric dyeing & printing, London: Conran Octopus. – which will be added to my new list of reading done for the assignment – here. Identify design ideas to translate and develop onto fabric, well-structured in terms of contrast and harmony. At least four of them is the ask, and I’ve enjoyed trawling through previous work to find possibilities. 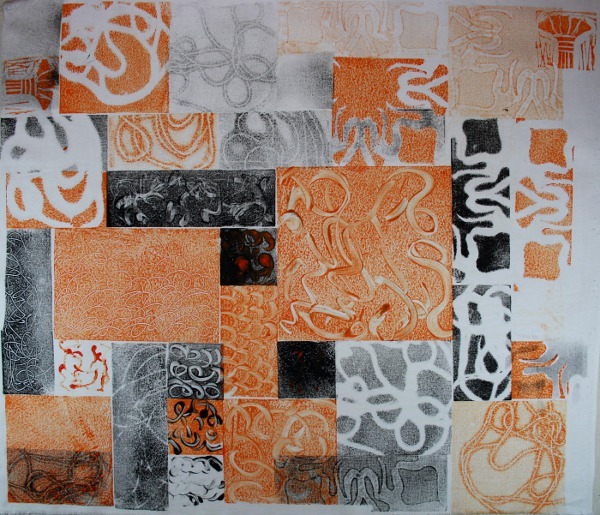 I have lots of sketchbook work, including variants that have been developed into a stencil and manipulated on the computer into a repeating pattern. I could also go beyond a single motif and experiment further with a design complete in itself. I got excited with the possibilities for layering in my previous post here and the medallions could be interpreted in stamping or silk painting or… I think it would also lend itself to different proportions and be quite adaptable. This has been another favourite. I’ve sketched out here a very rough idea to use it in a bag project. I’m thinking of using this as the centrepiece, then adding hieroglyphic-like elements around it. Plus a co-ordinating fabric using related elements for the back of the bag. I did the original scribble right near the beginning, last August, and have since played with it in gimp. I like the energy and the colours, and think it could be an interesting challenge to develop elements that retain that energy and also achieve balance of some kind. This started in the class with Peter Griffen and I’ve done a lot of work in the sketchbook since including making a stamp. While reviewing the sketchbooks I found quite a few other examples of birds – from Dufy, a mother-of-pearl playing counter, Tutankhamen – and today I tried a few ideas to adapt them into a similar bold-line style (sketchbook page here). I’ve read the instructions a few times and am not clear on how far developed the ideas should be before I test them out on fabric, but I deem this far enough. Lots of space for one idea and experiment to spark the next. Now it’s just a question of where to start exploration. 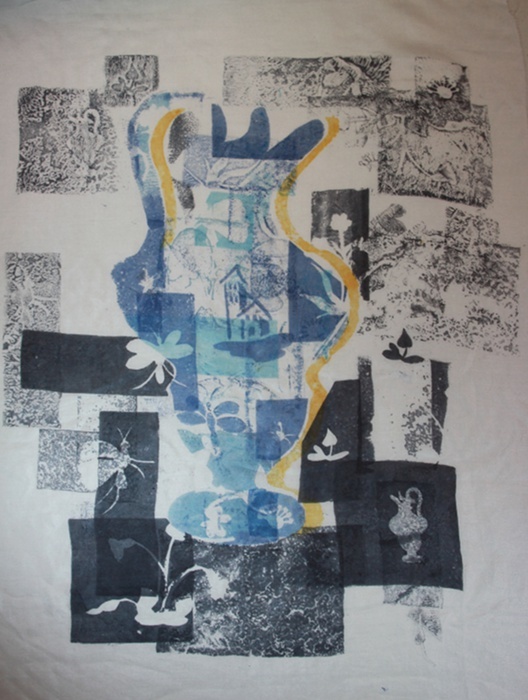 The painting and printing project starts with going through one’s fabric collection, spending some time looking and handling, noting the individual qualities of weight and surface. 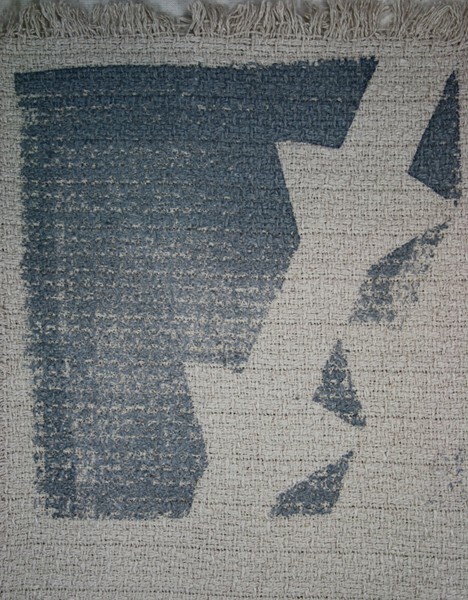 The idea is to develop visual and tactile awareness, plus select a dozen or more textile surfaces for the following work. 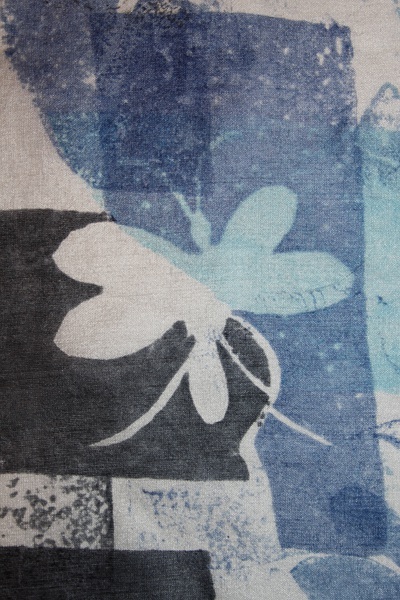 In later stages we select design ideas, then use print and paint on textile to develop and express those ideas. I’ve noticed in earlier exercises that I can get confused and overwhelmed if I’m trying to learn and experiment with too many things at once. I decided to make a “sample book” with pages of a wide variety of textiles and a standard set of painting/printing on each. That way I can keep focus on design and mark-making in the later stages. We’re being asked to experiment and explore, be adventurous and take risks, so this could be seen as a safety net or even restricting. For me it’s partly “I need to know the rules so I can break them” and partly managing complexity. It feels freeing. This sample is on a fine cotton. 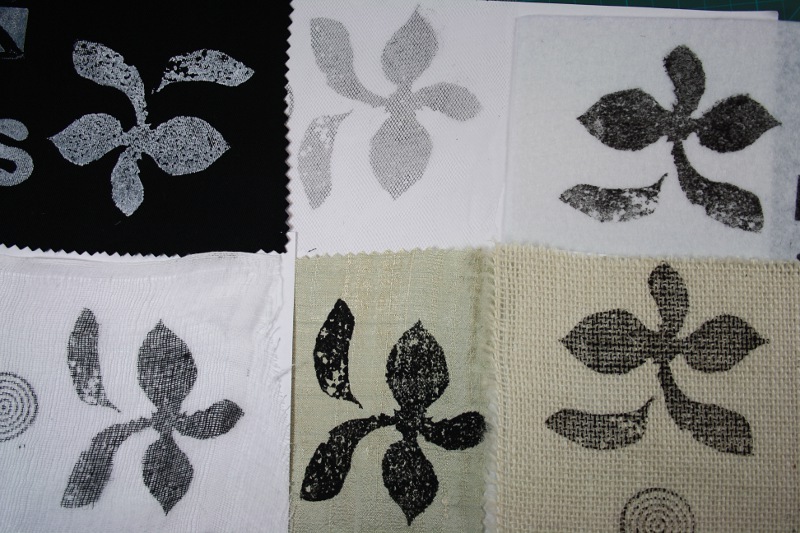 I used Permaset Aqua Supercover textile printing ink – black on the white or light fabrics, white on the black samples. 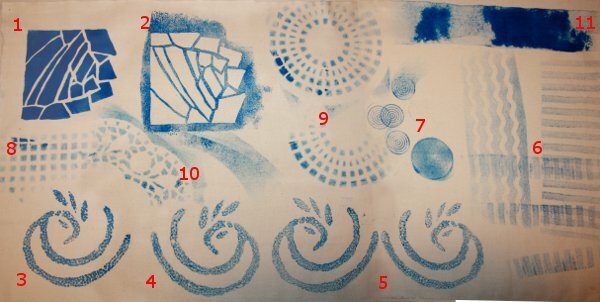 The techniques are mostly ones seen in the preparation stage here – stencil, a range of different stamps, sponge roller (10), brush (8), textile marker (12), and crayon (10). I now have 24 samples, all pretty much the same format (most have only one letter stamp, and one has (11) missed – oops). This gives great information on the basic characteristics of each textile, and it’s very interesting to compare and contrast. Top row, left to right: a heavy black twill cotton, white tulle, white acrylic felt. Bottom row: cotton gauze, dupion silk, hessian. I generally photograph everything, but not this time. You really do have to touch and see the real things to appreciate the differences. Even in person one thing I can’t judge yet is the impact on the hand of the fabric. I need to heat fix and wash everything. It was amazingly wet yesterday when I did most of the printing and I want to leave it a few days first. Tissue silk (3.5 mm georgette); silk chiffon; 5.5mm silk organza; felting paj silk; 8.5mm silk habutai; dupion silk (light green); duchess silk (beige); two different weights of cotton gauze; a light weight cotton (voile perhaps); brushed cotton (flannelette); cotton damask; a fairly light linen; hessian; a heavy semi-basket weave upholstery fabric to approximate the texture of some handwovens; tulle; crystal organza; acrylic felt. Silk organza; cotton voile; heavy cotton twill (drill? ); hessian; tulle; acrylic felt.